In today’s culture in order for parents to get things done, the screen has become an easy solution to occupy children, when parents are busy. A recent survey conducted by ParticipACTION found that 76% of parents in British Columbia with children 12 and under have used screen time to occupy their child. 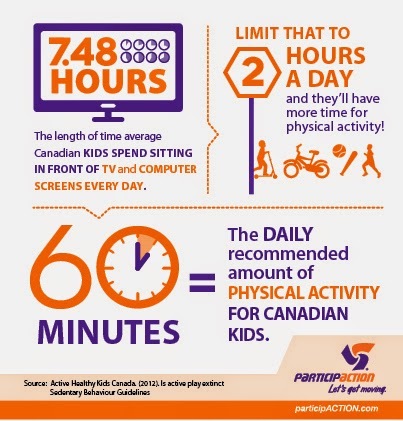 ParticipACTION and Healthy Families BC have launched a co-branded campaign, Make Room for Play, to encourage and support parents, caregivers and educators in British Columbia to reclaim childrens’ time spent in front of screens for physically active time. Did You Know? The average Canadian child spends 7hrs and 48 minutes a day in front of a screen – that’s almost a 40-hour work week. Too much screen time can make it hard for a child to sleep at night, raise a child’s risk of attention problems, and leave less time for active, creative play. 91% of parents in British Columbia say they plan to make physical activity a priority for their children in the 2015. The Make Room for Play campaign offers a great opportunity to help parents get their children more active. The campaign includes a series of four 30-second videos running on television, in cinema and online, supported by digital ads, social media and tips and tools for parents and caregivers. For more information, helpful articles, and additional tips visit www.participaction.com/make-room-for-play-bc/ on how kids—from toddlers to teens—can reduce screen time and increase play time.